These steps will cover setting Microsoft Office Outlook up with a new email account. 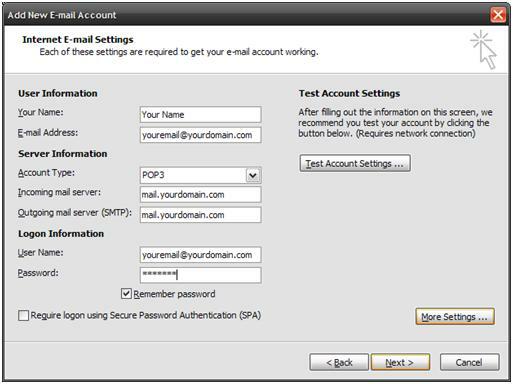 You will need the following information to setup the email account. You should have been given this information when you added your email account. If you do not have it, feel free to send an email to support@dnawebagency.com explaining what you need and we can reset the password for you and get you the incoming and outgoing server names. Once you have it opened click on the Tools Menu and select “Email Accounts” or “Account Settings” depending on whether you are using Outlook 2003 or 2007 respectively. If you selected “Email Accounts” you will also need to select the option for adding a new email account. You will see a window asking you what kind of email account you want to add- select the “Microsoft Exchange, Pop3, Imap, HTTP” button. Click next and then select the option to manually configure settings. Click next and choose the option for setting up an Internet Email account. Fill in the settings above replacing “Your Name” with your name, “Your Email” with your email, and “Yourdomain.com” with your domain name. After you have done this – click on the “More Settings” button. There is only one more thing to do before this account is operational. Once you have made those changes go ahead and click ok. Click on the button that says, “Test Account Settings” – if everything is entered correctly then everything should check out fine. This section explains how to enable SMTP Authentication for Outlook XP (also known as Outlook 2002), Outlook 2003 and Outloook Express. From the Tools menu, select Email Accounts. The Email Accounts box appears. Double-Click on your email account, The Internet Email Settings appear. 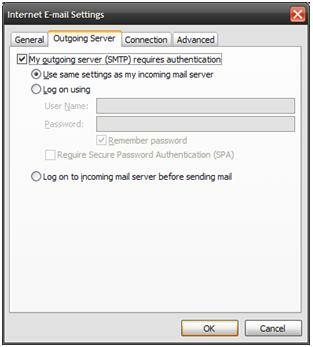 Click the circle-box My outgoing server (SMTP) requires authentication, and verify that the circle-box Use same settings as my incoming mail server is selected. Click on the Settings button next to this and make sure that the “Use same settings as my incoming server” radio button is selected. Click Close to close the Internet Accounts window. Click Send/Receive to ensure things are working correctly. Have you ever encountered an issue in which Outlook asks you for your account password every time you check your email? Sometimes even telling Outlook to save the password does not help! This tutorial will cover setting Outlook to remember passwords. This tutorial covers Outlook 2003 and 2007 versions. This does not cover Outlook Express. There are several things that you will need to know in order to complete this tutorial. The best way to get Outlook to remember passwords is to set it within the email Account Settings area. The steps to get to this area are different depending on which version of Outlook you are using. If you are using Outlook 2003 you will need to access “Tools > E-Mail Accounts”. You will then need to select the “View or Change Existing E-Mail Accounts” option. 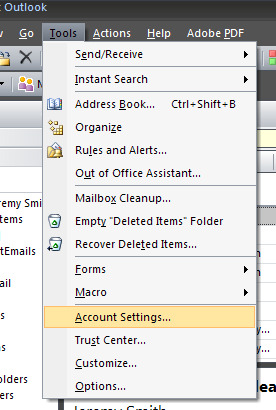 In Outlook 2007 you will need to access “Tools > Account Settings”. From here the steps are pretty much the same. You will see a list of your current email accounts come up. The steps from here are as follows. Double-Click on the one that is having problems. You should now be able to see the section where your username and password are entered. Re-Enter your Username with your Account Username. Re-Enter your Password with your Account Password. Click on the “Remember Password” checkbox. Click “Finish” – Congratulations! You have set Outlook up to remember your password. NOTE: We have provided this information to you as a courtesy. We do not endorse or directly support third-party products such as Mozilla Thunderbird or Microsoft Outlook.